You can keep low-energy activities out of your peak creative/energetic hours – save those for high-impact high-energy projects! You can work on something productive even when you don’t feel like you’re at the top of your game – and you don’t waste time trying to think of something to do when you’re feeling blah. You can identify your energy drainers and find ways around them, or limit their effect on the rest of your day. It’s good to know how to take advantage of your high energy moments. It’s also good to know what moves you from one energy state to another. What do you do to relax or unwind? What do you do to recharge? What drains you, and what gives you more energy? What can you do when you feel tired, and what should you do when you feel at your peak? Don’t waste great energy on low-value or low-energy tasks. Don’t get frustrated if you can’t focus on high-energy tasks when you’re tired. Here’s a list I made of the things I do when I have low, medium, or high energy. For the most part, things energize me. 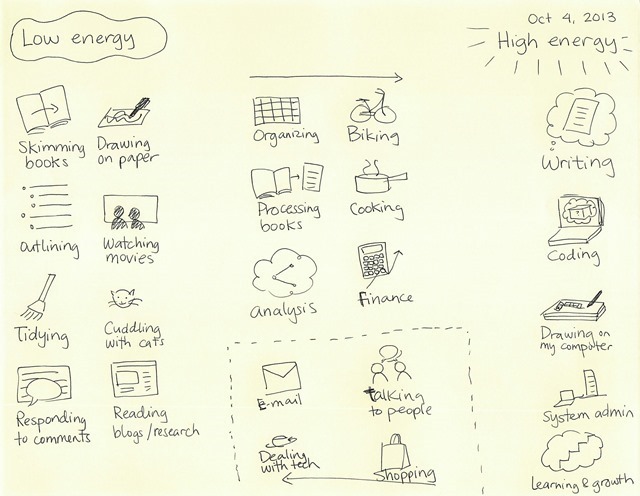 Some activities like e-mail, talking to people, shopping, or dealing with technical issues can be draining, so I try to avoid doing them before high-energy activities. When I drew things out like this, I realized that drawing on paper was different for me compared to drawing on my computer. I find it easier to draw on paper at night because drawing on my computer often tempts me to stay up late. I started drawing more on paper in order to take advantage of those low-energy moments and expand the time I spend thinking visually, scanning the sketches in and using my phone or computer to organize the sketches afterwards. If I’m alert and energetic, I know that I should focus on writing, coding, or other high-energy activities instead of spending time handling e-mail or getting distracted by watching a movie in the background. What do you do when you have high energy? How about low energy? How do you energize yourself, and how do you deal with your drainers?